Registration papers are important! They are legal documents stating that your Lippitt IS who you say it is. Please be respectful and keep those documents safe. IF you “ misplace” them or otherwise lose those papers, please report it to TLMHR ASAP so we can address what might be done. In this day and age of Morgan FRAUD it is imperative to maintain you horse’s registration integrity. When you sell your Lippitt the registration papers go with that Lippitt. The Lippitt Morgan Horse Registry, Inc.(“TLMHR, Inc.”) is a repository of breed information for the Lippitt Morgan horse and a promoter of the Lippitt Morgan as a recognized, defined gene pool of Morgans. We are a staunch advocate in the preservation, protection and continuation of the Lippitt Morgan horse. We also provide free educational material for anyone interested in the Lippitt Morgan horse. Any organization that supports the Lippitt Morgan is a good thing. Please note that TLMHR, Inc. does not have members. It is not a club. It has a Registrar and a Board of Directors. TLMHR, Inc. is the ONLY Lippitt Morgan horse entity with a 501c3 status. Lippitt Morgan horse owners have the option to double register or, as often is the case, not register their Lippitt Morgan horses at all. People remain free to choose how and where they register their Lippitt Morgans. We hope people who have Lippitt Morgans will see value in their registration with TLMHR, Inc. We simply seek to keep track of the Lippitt Morgan, which is dwindling in numbers, building and maintaining a DNA database and pedigrees with as much completeness as is possible. This in no way competes with the national registry. Nor does it compete with The Lippitt Club or the Lippitt Morgan Breeders Association. 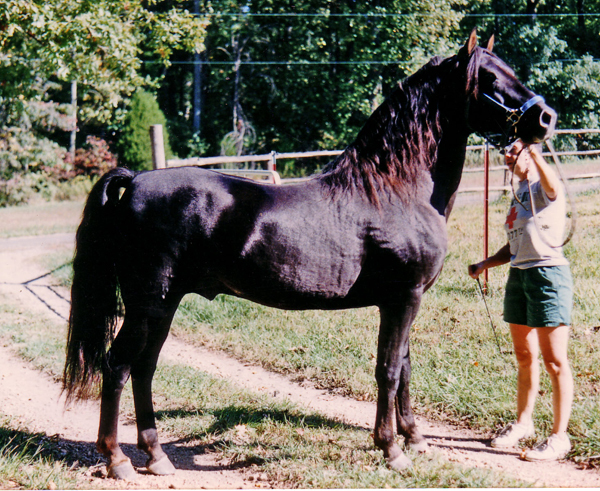 Unlike TLMHR, Inc., the national registry of the American Morgan Horse Association does not focus only on the Lippitt Morgan. TLC and the LMBA are about people who want to get together with a common interest in Lippitts. TLMHR, Inc. is about the Lippitt Morgan, not about organizing activities for people (a membership). It is a non-political, not for profit organization (501c3) and intends to stay that way. As far as the national registry of the American Morgan Horse Association and TLMHR, Inc. goes, think of it this way: An individual notices a new coffee shop on the corner, goes into the shop demanding to know by what right does the new store owner have to open this shop and sell coffee, after all, there is a Starbucks in town and Starbucks (according to the demander) makes coffee. Little did the demander know that Starbucks had begun to overcharge its customers and to top it off they had begun to water their product down. The coffee no longer tasted like coffee and nor did it look like coffee. There is nothing confusing about a legitimate corporation with a competent ETHICAL BOARD of DIRECTORS maintaining a blood registry of a specific breed of horse with COMPETENT, EVIDENCED-BASED RECORDS. TLMHR, Inc. runs the same DNA test that the national registry of the American Morgan Horse association does, but for a lot cheaper. TLMHR, Inc. does not stop anyone from registering with the national registry of The American Morgan Horse Association. Many people do both. 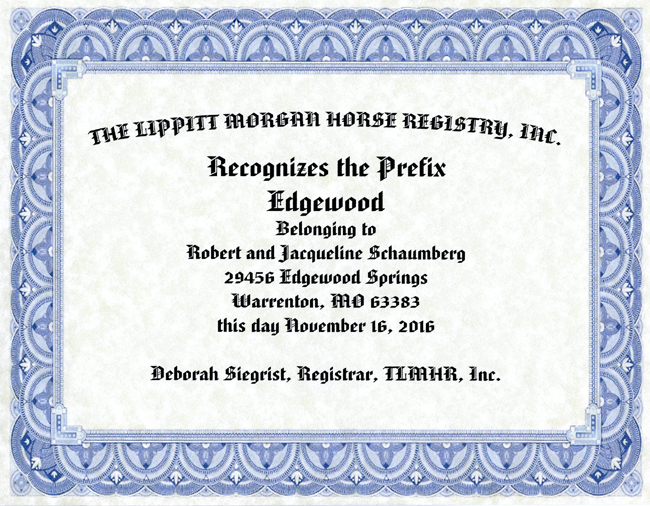 THE HORSES REGISTERED WITH THE LIPPITT MORGAN HORSE REGISTRY ARE MORGANS THROUGH DNA TESTING AND BELONG TO THE LIPPITT MORGAN HORSE FAMILY.